GNU Ring (https://ring.cx) is a free as in freedom and open source replacement for any of Skype-like internet communication platforms. Ring is a voice and video call program, chatting, and in the same time VoIP client, with point-to-point-encryption model to ensure your privacy and security at maximum rate. It is available in mobile (Android) and desktop platforms (Windows, Mac, GNU/Linux). 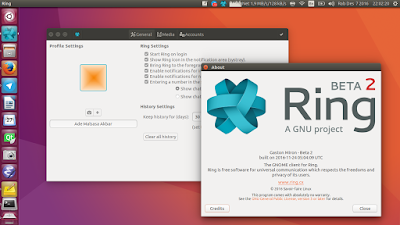 Now GNU Ring is available for Ubuntu 15.10, 16.04, and 16.10. 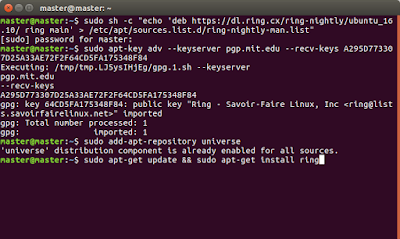 This article gives you step by step instructions to install GNU Ring on Ubuntu. 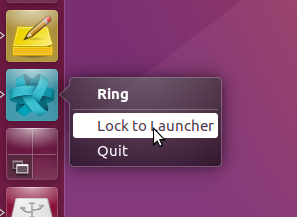 Choose one from instructions below according to your Ubuntu version. Open your Terminal (press Ctrl+Alt+T) and then copy one line by one line of the 4 commands. See picture below to make sure you know the steps clearly. This picture demonstrates the installation step by step in Ubuntu 16.10 Yakkety Yak. 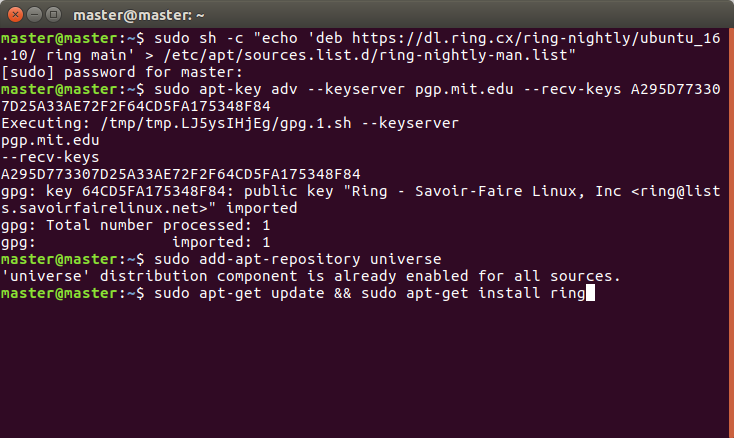 sudo sh -c "echo 'deb https://dl.ring.cx/ring-nightly/ubuntu_15.10/ ring main' > /etc/apt/sources.list.d/ring-nightly-man.list"
sudo sh -c "echo 'deb https://dl.ring.cx/ring-nightly/ubuntu_16.04/ ring main' > /etc/apt/sources.list.d/ring-nightly-man.list"
You can place the GNU Ring icon on the vertical panel ("Launcher") by running it and ring-click its icon > Lock to Launcher like this.